While many people are concerned about what they eat and their body image, eating disorders are marked by extremes. They are present when a person experiences severe disturbances in their eating behavior, such as extreme reduction of food intake or extreme overeating, or feelings of extreme distress or concern about body weight or shape. 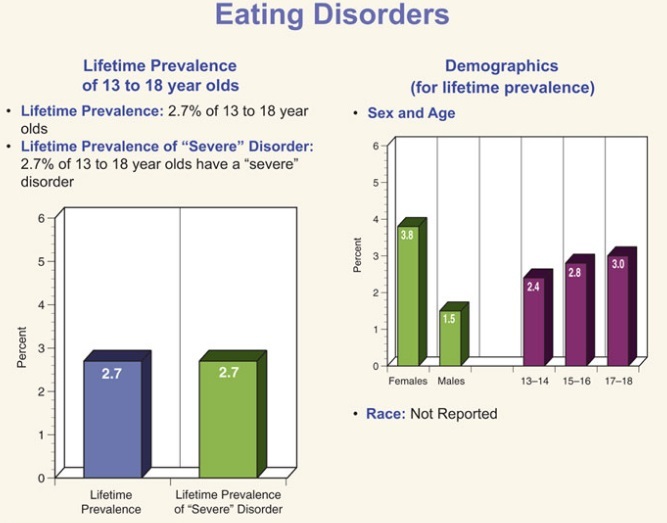 The following chart shows eating disorder information from the National Comorbidity Survey – Adolescent Supplement (NCS-A) , and defines an eating disorder broadly as anorexia nervosa, bulimia nervosa, and/or binge eating disorder. It includes an estimate of 2.7 percent for those suffering from an eating disorder. 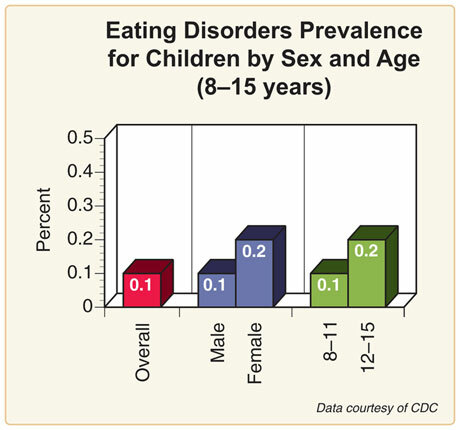 Girls are more than two and a half times as likely as boys to have an eating disorder. The Centers for Disease Control and Prevention’s National Health and Nutrition Examination Survey (NHANES) examines the prevalence of eating disorders among children who are slightly younger than those in the NCS-A. Data from the NHANES estimate the prevalence of eating disorders among 8 to 15 year olds to be very low; one tenth of one percent of this group.